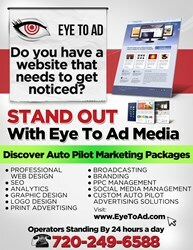 Eye To Ad Media Announces Midnight Madness Blowout Sales Event on SEO, Graphic Design and Web Development Services. A national web design firm announces Midnight Madness Blowout Sales Event on search engine optimization, professional graphic design and advanced web design services. This unique sale will begin at midnight and offer shoppers the opportunity to receive highly discounted pricing. This is a great chance to save on seo, web design, flier distribution, graphic design and marketing packages. Eye To Ad Media, a company that’s sticking out more often in the world of web design, announces a Midnight Madness Sales event on several of their business development services. For this sale the company will offer half price seo services, keyword optimization and discounts on new websites up to 30%. Internet marketing is almost essential for business owners. Social media, search engine optimization, coding and knowing how to perform well on the organic SERP’s is only part of an online marketer’s repertoire. Internet advertising is a vast field that may seem a little bit overwhelming for those not versed in the new technologies. That is why Eye To Ad has created turnkey media packages that can instantly begin to get the word out for any organization worldwide. They work hand in hand with major broadcasting agencies, design cutting edge videos and publishing copy that’s designed to get noticed. According to the company, branding services and graphic designs will also be deeply discounted for this promotion. It’s imperative for a business to have a logo that’s strategic and memorable. Sometimes it is effective to integrate a catchy slogan or tag line into the logo as well. This can potentially help with brand recognition and potential customers being able to decipher the services immediately. While online marketing definitely has a strong position in the advertising world, print campaigns can still be incredibly effective. Many times business owners will have a print campaign that works in conjunction with a mobile or internet campaign. With smart phones being increasingly popular and useful, QR codes are a great way to potentially increase conversions and help with lead tracking. Knowing which forms of media are working, versus the ones that are not; can save countless dollars and time. In an effort to help business owners streamline the many complexities of an effective advertising campaign, Eye To Ad has created marketing packages that utilize several essential media components. Link building, keyword research, onsite seo, offsite seo, analytics and social media management are all among the specialized services that the company can assist with. Those who are interested in more information are encouraged to contact a representative for a no cost initial consult.